The BARber offers unique concept with two-in-one fun bar and barbershop experience, is open to day visitors of all ages. The hotel complete with semi indoor and outdoor pool, while the younger ones might like the Kid’s Creative Room and pool. 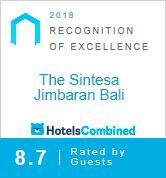 To complete the experience, The Sintesa Jimbaran also boasts one of the best gyms on the island as well as a spectacular spa sanctuary.